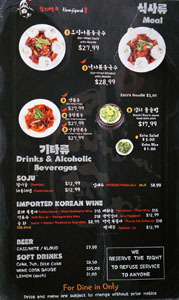 If we're talking about Koreatown restaurants, Ham Ji Park has got to be one of the most iconic of the bunch. 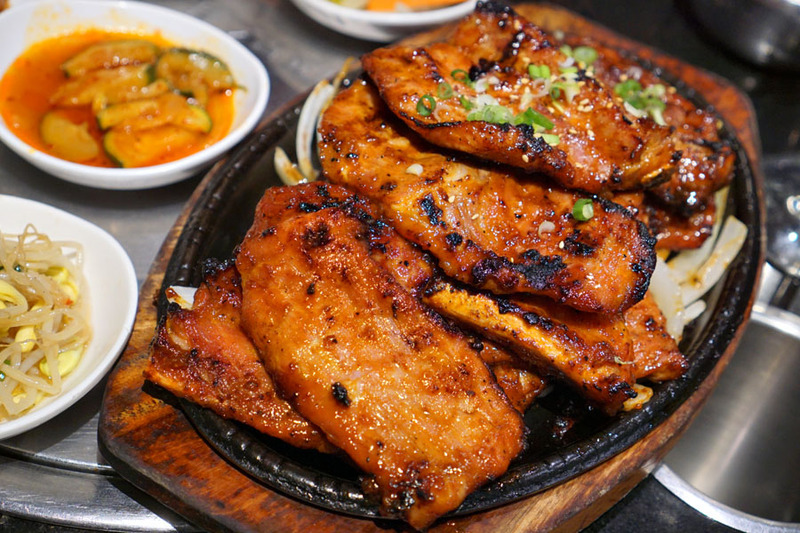 From what I gather, the original Arlington Heights location (4135 W Pico) was founded in 1993 by Chef Kim Hwa-shin and her husband Kim Young-sun, while the second, more popular West 6th outpost was opened in 2002 by Kim and her daughters Eunji Kim and Mimi Cho (née Kim). 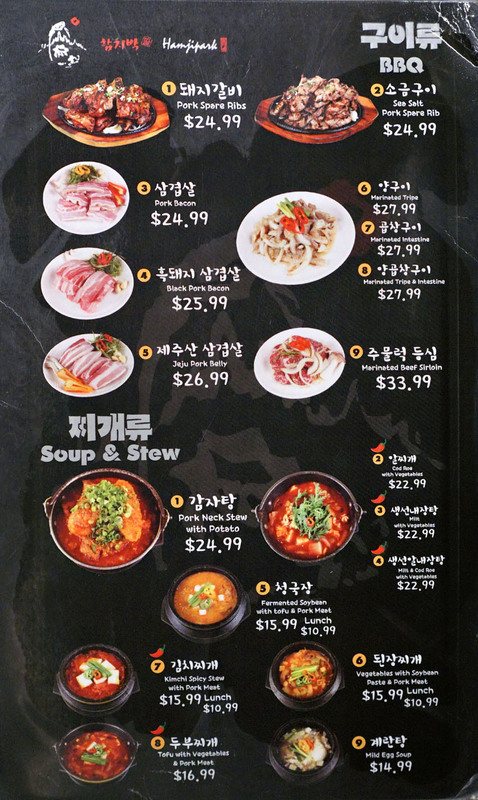 Given the success of those restaurants, I'm surprised that it took until May 2016 for the third Ham Ji Park to debut in Buena Park, one of the two epicenters of Korean activity in Orange County (the other being Garden Grove). The owners here are Mimi and her husband Won Dae "Adam" Cho. 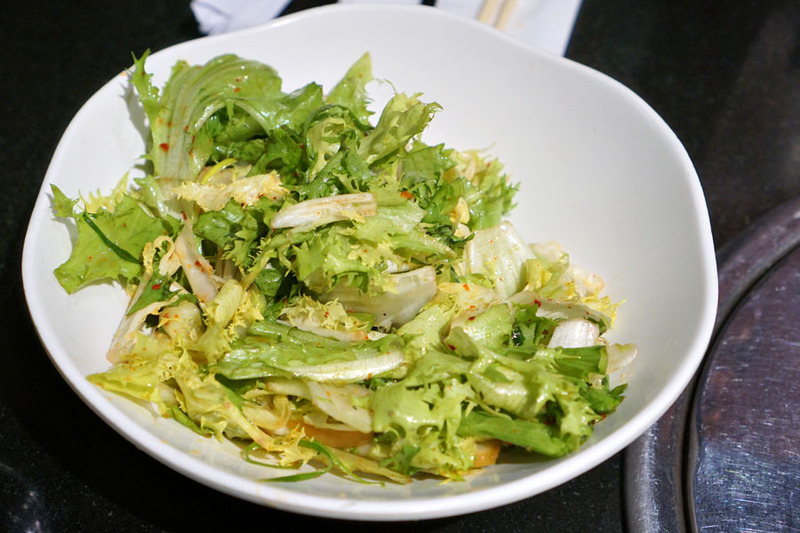 The couple later expanded to Rowland Heights in June 2017, though that location has since closed. The restaurant takes over an address that was previously home to Mr.6 Tabletop Grill, an AYCE KBBQ joint that featured gimmicky translucent stone grilling surfaces; before that, the building housed a Denny's, which opened circa 1994. Decor-wise, things haven't really changed since the Mr.6 days, which isn't a bad thing. It's a pretty attractive space, and pictured above is one of the two main dining areas (the one closer to the street). 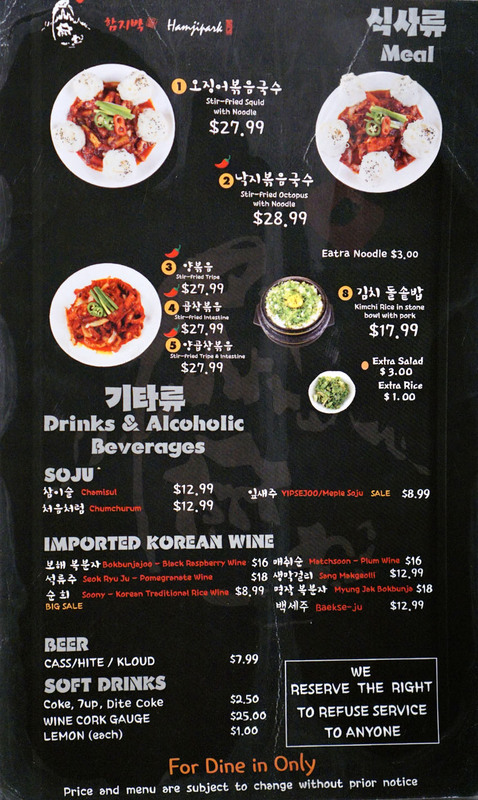 As far as the menu goes, it's pretty much identical to that of the K-town location, though I do notice the addition of Sea Salt Pork Spare Ribs, which I'm mildly curious about. The beverage situation is about the same as well, while corkage is offered at $25. Click for larger versions. 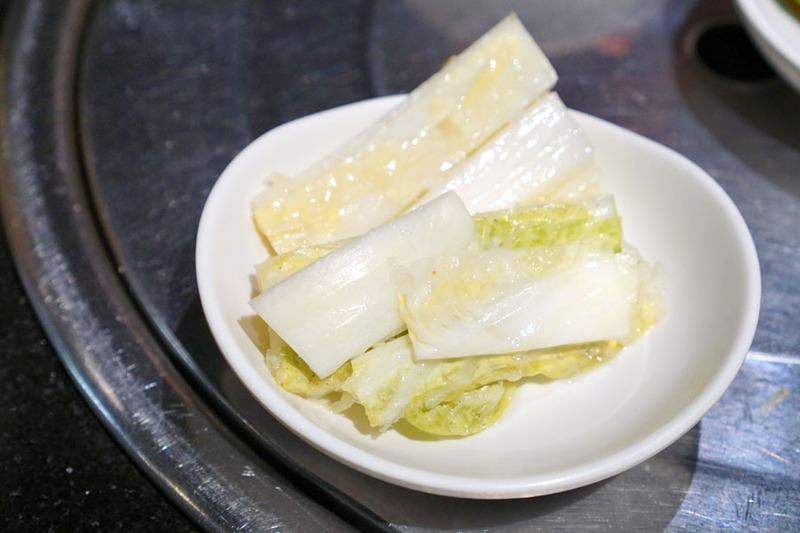 Our first of six banchan was the baek-kimchi, which came out bright and crunchy, with a subdued spice as expected. 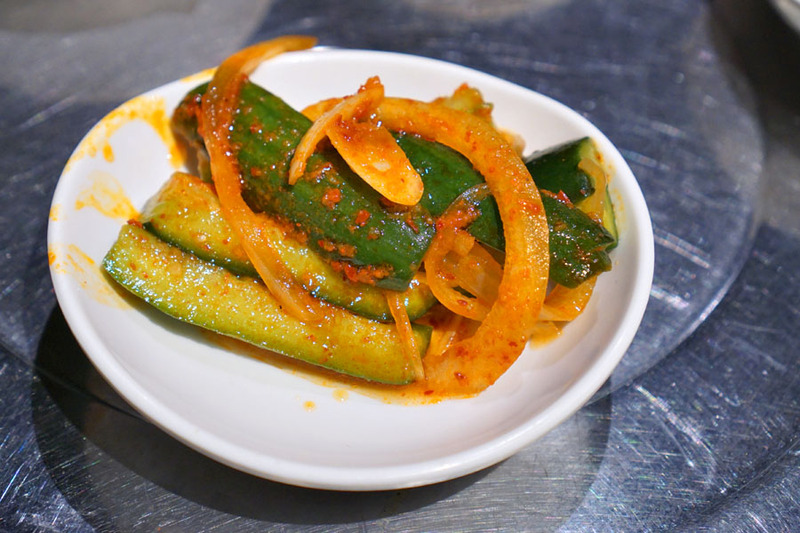 The cucumber-based oi kimchi showed off a pliant-yet-crisp consistency along with a relatively restrained heat. 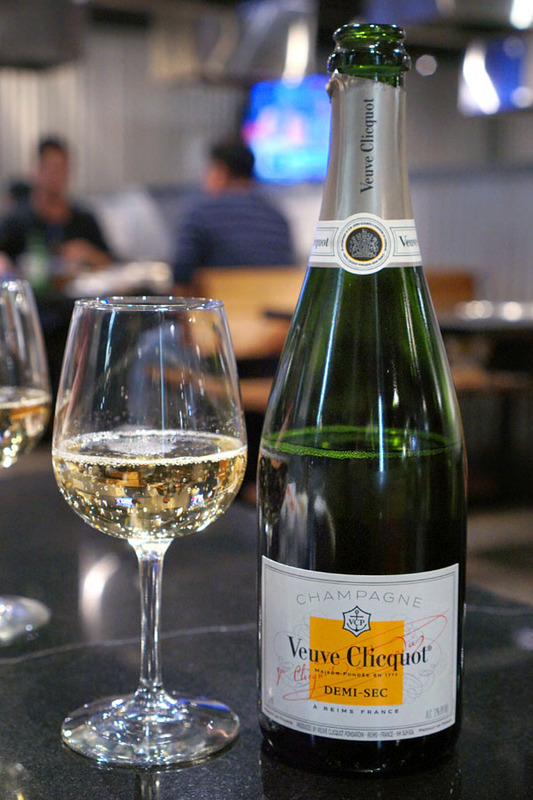 To drink, we had the NV Veuve Clicquot Ponsardin Champagne Demi-Sec. The wine smelled of ripe apple and honey, alongside a hint of biscuit. Meanwhile, it tasted lush and sweet, with brown sugar and vanilla notes joined by a touch of tropical fruit--pretty tasty overall. I don't encounter demi-secs all that often these days, so this was a welcomed change of pace, and stood up well to the aggressive flavors of the food we were having. 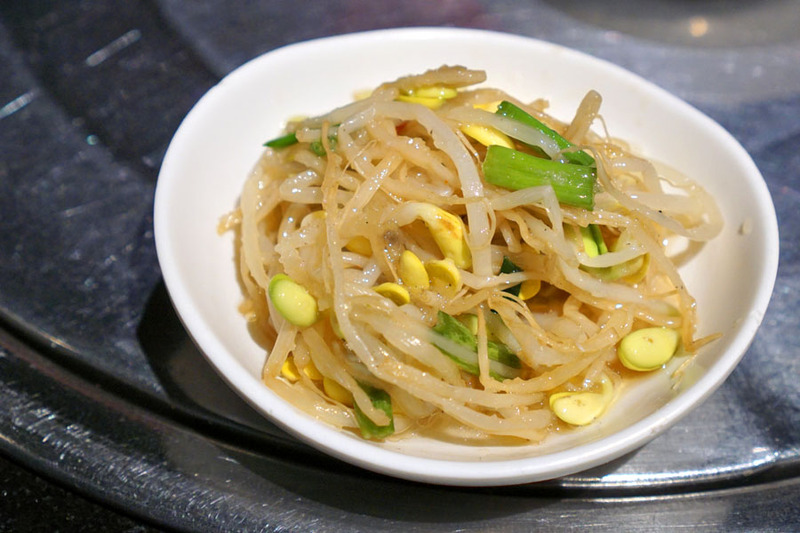 I had no complaints with the kongnamul muchim (soybean), which was super well-seasoned, with a nice chew to boot. 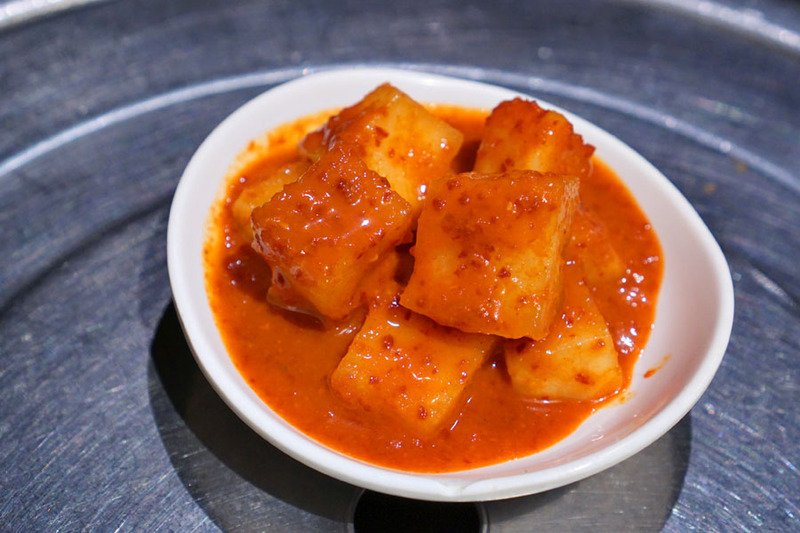 Kkakdugi (cubed radish) was softer and sourer than usual. Naturally, we had to get Ham Ji Park's signature dwaeji galbi, and the dish was right on the money tonight. As regular readers will know, I'm quite sensitive to sweet in my savories, so I'm always impressed at how the sweetness of the pork ribs is so balanced. It's a great combination of that aforementioned sweetness, along with porky funk, a touch of heat, and the bitterness of all those charred bits. Texturally, I found the meat generally tender, but with just enough chew to make things interesting. 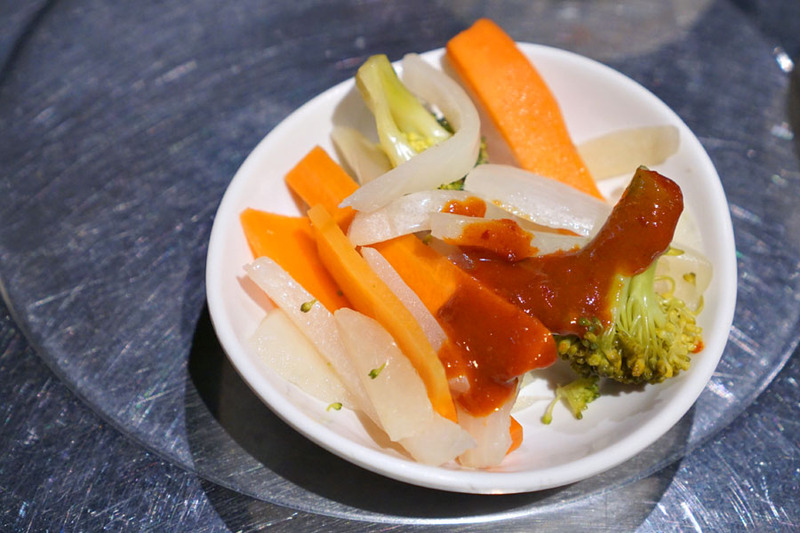 Pickled carrot, onion, and broccoli were paired with a gochujang dressing. 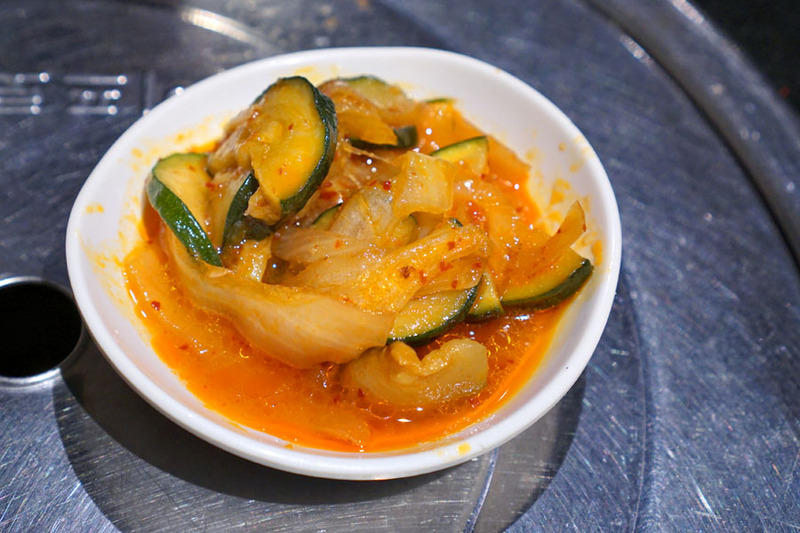 The hobak muchim conveyed a subdued sweetness from the squash, as well as a persistent earthiness that I appreciated. 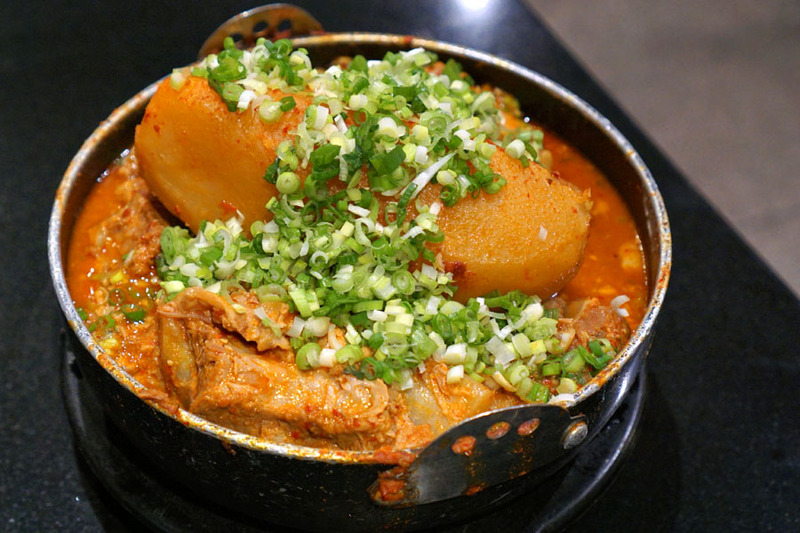 Next up was Ham Ji Park's other signature dish: gamjatang. 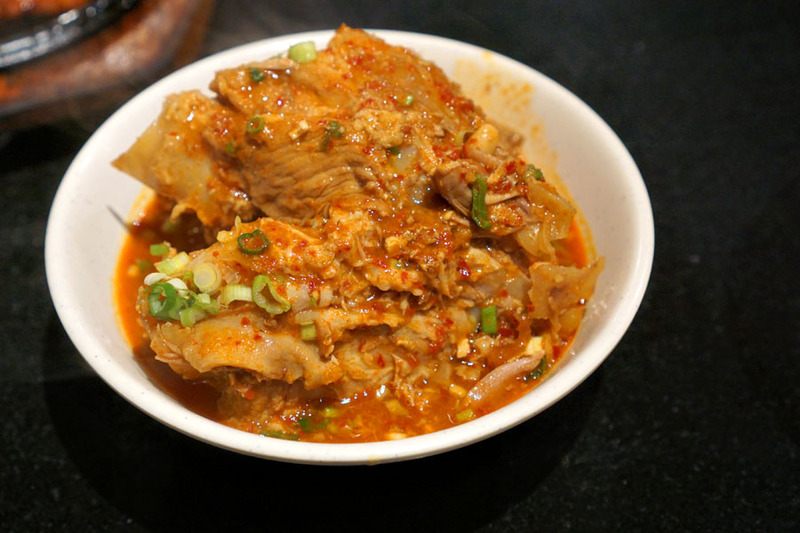 Long-cooked pork was falling-apart tender, and worked hand-in-hand with the more gelatinous, cartilaginous parts of the meat. In terms of taste, the amount of heat was just right for me, and kept my focus squarely on the pork. Also key was the use of what I believe was ginger, which imparted a superb zestiness to the dish, one augmented by the application of green onion. Add to that the heartiness of potato, and you have a very tasty soup indeed. The salad was well-dressed and better than many that I encounter. A good foil to all the heady flavors we were enjoying this evening. Our meal tonight was pretty much spot on--I had no complaints. 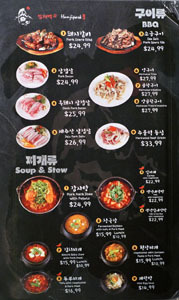 A lot of people say that this Ham Ji Park's not quite as good as the one in K-town. Maybe it isn't, but it's close enough that I would have a hard time telling the difference, and the reduced waits are an added bonus. In any case, while writing this post, I actually discovered that Mimi and Adam, in partnership with one John Lee, opened up a fifth Ham Ji Park back in October last year, this one in Honolulu's Koreamoku neighborhood. The couple seems to have growth on the mind, so it'll be interesting to see where they expand to next (the South Bay comes to mind). Oppa Gangnam Style baby girl. "sourer"??? not a word dude. And yep, just a single order of the ribs for me and a friend. Combined with the gamjatang, it was actually enough (though I believe we did get a refill on the soup).